In a previous life, when I was still doing my undergrad in International Management, I took a course in Corporate Social Responsibility (CSR). CSR is in the first place the compliance with any law and policy a company is operating in. But it has become fashionable for companies to claim that their CSR engagement goes beyond compliance and that they actually foster some social good such as improving workers’ rights or environmental concerns. But how much CSR is possible, if the companies goals are inherently bad for people? What if the product is harmful to consumers? Some experiences during my travels made me ask these questions. When I traveled to places like India, Rwanda and Kenya, I understood what a global corporation is. I want to use Coke as an example, but there are a bunch of other companies that are comparable. Coke is ubiquitous. I mean, I have seen Coke simply in EVERY SINGLE PLACE that I have ever traveled to. Even at the tiny island called Wasini in the Indian Ocean - where there’s no electricity and no running water – you will find Coke. Sure, you could say that the market regulates itself. There’s demand for the product and Coke has such a good supply chain that they can cater the demand for Coke better than electricity companies can cater the need for electricity. It’s an absurd setup, but fair enough. But there are three points that really bother me about the fact that people at Wasini island (and similar places) get to drink Coke. Firstly, it’s the brainwash which is created through Coke advertising. Yes, also in Germany you can find Coke advertising and people here are also exposed to marketing brainwash. But whereas in Western countries the question is whether to buy Coke, Pepsi or maybe some local brand, people in places like Wasini face a different choice. In these communities, people have hardly enough money to survive and cover the basic needs such as doctors’ bills and school books. 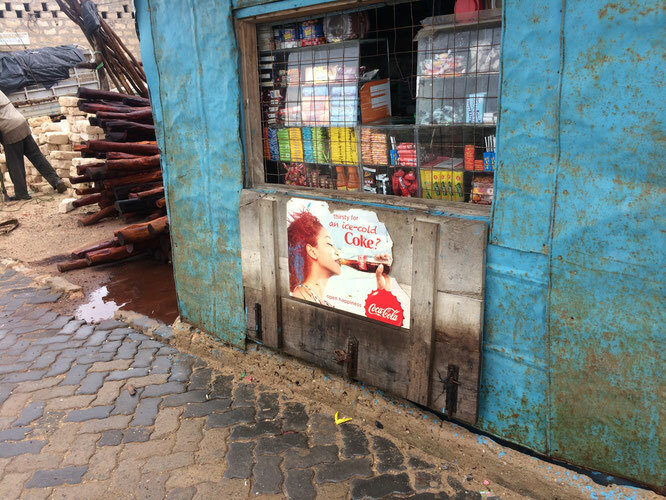 A Coke at Wasini island costs around 100 Kenyan shillings. If you earn 3,000 shillings a month, buying a Coke is an investment. You can either buy a Coke OR a school book for that money. Due to Coke’s crazy marketing activities in these regions, for many people the wish to consume Coke might be in fact as urgent as the need to cover other basic needs. Secondly, we are talking about regions of the world where malnutrition is a real problem. In the West, we see Coke as an unhealthy sweet treat, which is an add-on to our (in most cases) sufficient diet. In many of the remote places where Coke is being sold, it is an unhealthy add-on to a totally insufficient diet. There are numerous studies on the negative effects of sugar on your body, so I don’t want to go into detail about this topic. What is more, caffeine is addictive, leading to symptoms such as headaches when you stop your usual caffeine intake. But these financial and health concerns are not the only thing that puts me off about seeing Coke in rural areas of developing countries. The third and last point that I want to mention is garbage. Products such as Coke (and to be fair even more so products that are being sold in plastic packaging) create garbage. Again, the problem exists also in Western countries, but in most Western countries we have well established waste collection systems. These do not exist in places like Wasini island. Obviously, the lack of waste collection is not the fault of Coke and other corporations that operate in these countries. But at the same time, it is a known fact that waste collection and recycling is a serious topic there. Going back to my initial point about corporate social responsibility, I just want to drop a few questions. Just ask yourself: is it ethical to sell an addictive, costly and unhealthy product to people who are poor and suffer from malnutrition? Should companies be allowed to sell their products in places where collection and recycling of the packaging is impossible? Personally, I don’t think so. What can be done? According to my own observations and reports of local friends, governments in these places are often highly corrupt and change (such as the implementation of waste collection) is too slow to keep up with changes of purchasing behaviors. In addition, it’s pretty likely that governments have crude incentives to tolerate the market entry of Coke. CSR departments exist, but do they have the power to do anything? Or do they only exist to maintain the neat façade of corporations? The fact that garbage problems like the one I have described exist in most developing countries makes me doubt the effectiveness of CSR departments. What's up, for all time i used to check website posts here early in the daylight, as i like to learn more and more.